Published on March 7, 2013 in the Whig Standard. Hillier was among those who attended a public meeting held Wednesday evening in Bath that was hosted by representatives of Windlectric Inc., a company formed by Algonquin Power Co. of Oakville and Gaia Power of Kingston. The developer has been granted a contract by the government, but the project — which would see 36 wind turbines erected on the island just west of Kingston — has yet to be approved. Hillier said he didn’t mince words with company representatives, and he believes they were surprised about how adamantly he opposed the project. “I think the phrase that I used was that the Liberal government and themselves should take their wind turbines and put them where the sun doesn’t shine and the wind always blows,” he recalled. 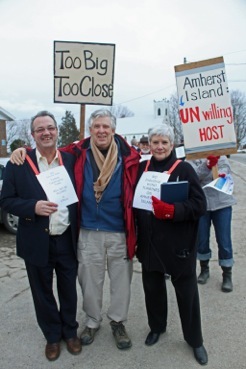 Island residents opposed to the turbines being built have said they may form a citizens coalition that would physically block or slow construction crews if all other avenues of opposition are exhausted. Those same residents believe that the hamlet of Stella, where the ferry from the mainland docks, will be ruined by construction crews constantly driving through it with the large turbine blades and the like. He believes that the act is being “disrespectul” of people. “This is the only area of law that we have in this province where we have categorically stated in the law that the community has no say and no involvement in the decision-making process. We would not accept that in local zoning, we would not accept it for the placement of a school or a landfill. We do not accept it under any other set of conditions,” Hillier stated. He considers wind-generated power to be inefficient and potentially hazardous to the health of wildlife and people. “No company would build these things without these exorbitant rates that they pay, which, of course, (taxpayers) have to pay for,” he said. Allowing a turbine to be erected on one’s property isn’t neighbourly, Hillier feels.